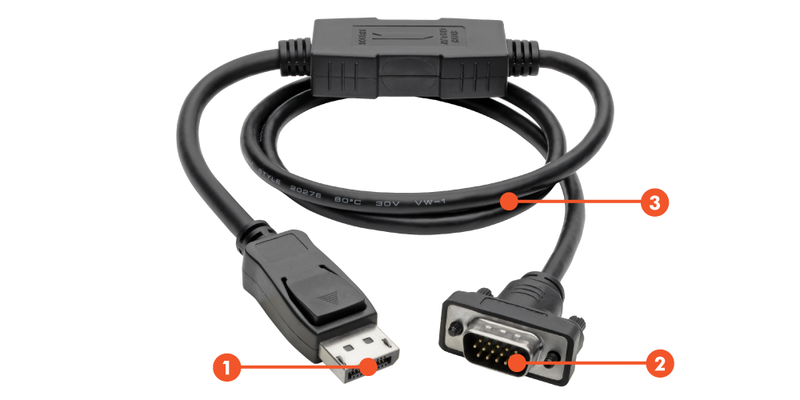 The P581-003-VGA-V2 DisplayPort 1.2 to VGA Active Adapter Cable connects a DisplayPort computer to the VGA port on a monitor, projector or television. With a latching DisplayPort male connector on one end and an HD15 male connector on the other, this cable requires no separate adapter. It lets you use your existing VGA display instead of buying a new DisplayPort monitor.Ideal for displaying video on a large monitor or digital sign, this cable supports computer video resolutions up to 1920 x 1200 and high-definition video resolutions up to 1920 x 1080 (1080p). It converts both Single-Mode and Dual-Mode (DP++) DisplayPort output, and is perfect for use with graphics cards, such as AMD Eyefinity, that do not output DP++ signals.First-class foil and braid shielding delivers reliable, error-free signal quality and protection from EMI/RFI interference. Nickel-plated connectors with gold-plated contacts ensure excellent conductivity. The DisplayPort plug latches to the port to provide a secure connection. Integral strain relief ensures the cable and molded connectors last a long time. This 3 ft. adapter cable allows you to connect a computer or laptop with DisplayPort 1.2 video output to a VGA monitor. Simply plug the cable into your DisplayPort computer and your VGA monitor. You don’t need a separate adapter or device cable. This adapter cable helps you save money by making your current VGA monitor compatible with a DisplayPort-equipped computer. Active digital-to-analog circuitry, premium double shielding and quality manufacturing ensure a clean, consistent video signal.